Incorporating running-shoe comfort into traditional designs is a Cole Haan signature. Expertly made from waterproof waxed suede, these chukka boots will see you through any kind of inclement weather. Sturdy rubber-lug soles provide great traction, while Grand.ØS energy foam gets you there in comfort. 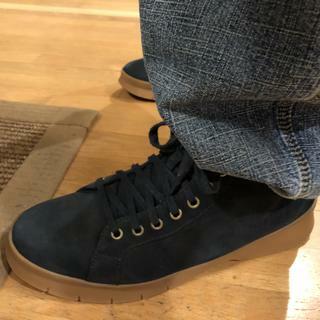 Obviously I love the color, but the styling is so eye-catching that you can get rugged-ish with these or casual as all get out just remember they are suede/nubuck and you'll be fine in the great outdoors .The footbed is very comfortable and feels like your foot is being cradled as long as you purchase the correct size. 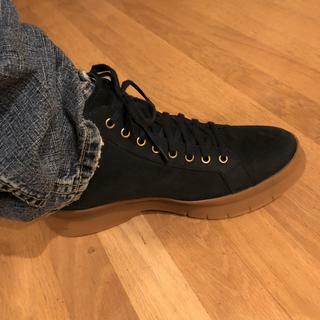 The gumsole feels supportive as all of the other of my gumsole footwear is since they are all as well made as Cole-Haan is. So I highly recommend these as a very good choice for you or yours. Great boot! Great for cold and wet weather. These shoes are very comfortable and very stable when walking. Shoes run half a size bigger. If you have narrow feet then it is half size bigger. But if you have wide feet then it's true to size. Cole Haan my go to classic and casual styling. I’ve had people stop me and ask “Where did you get those sweet boots?”, this statement is common to my Cole Haan selection. This boot is funky with swag. Damn near a perfect boot. I love these boots. They are warm easy to clean and comfortable. The size is true to fit. I live in Chicago and they did a decent job handling -14° weather. I should’ve put on two pair of socks, but for a quick trip to the store, by car. They did the job. So, unless -14° weather is your norm, they’re warm. There kinda hard to dress up, but that’s not why I bought them. They’ve quickly become my favorite winter boot. Looks great, feels fantastic, super warm, absolutely water proof. I just got a pair and love these. I noticed a few comments indicating these are a bit large. I have a true 9.5 and they are a bit larger, but not large enough to go up a size. I've used thicker socks which made all the difference. The detail inside and out of these are really nice. In terms of waterproof, I haven't explored that option yet. I like them too much to get them wet. These look great dressed up or down. As for cold weather, I live in the center of Texas so I can't really relate to how cold these will work out. I took these to the Philippines to wear in 90 degree weather with passing Typhoons. They held up well and were not at all hot to wear and are definitely waterproof! I am now wearing them in 35 degree weather and they are comfortable in cold weather as well which is amazing. I now have three pair and my lady friend who is very stylish found them to be attractive and appealing. I thought they might be a little too out back looking for the way she dresses but she loved them! You can dress them up or down as you wish. They are sure grippers on uneven and dangerous surfaces that are shifting and I had no blisters or discomfort after walking long distances in hot humid weather and jumping in and out of local transportation in Philippines which in itself can be a challenge if you are not accustomed to it. I am 69 years old and will take these on my next trip to South East Asia next year. I have many many many other shoes that could fit the bill but if I had to take only one this would be it. Shoes do run a little big, but I usually wear thin socks. With thicker socks in colder climates, should be about right. Very comfortable to wear. Recommended. Love the color. I owned different zero grands and when it comes to comfort nothing is next to it. I need a waterproof if I am working in the field. I liked the color and the utility of the design. Cole Haan comfort and style in a weather resistant chukka boot? These may end up being my new favorite boots! Great Cyber Monday Deal on the product I liked. How waterproof is “waterproof”? Can these boots withstand snow and sludge without feet getting wet? BEST ANSWER: Our fashion waterproof leather styles are crafted from leathers that have been treated to be water repellant and the sole seams have been sealed to keep your feet dry. While they are not waterproof like a rubber boot, they will withstand normal contact with the elements. They are not intended to be a foul-weather boot.